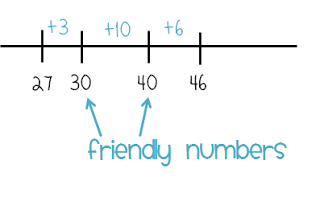 However, an empty number line can be a more useful tool for students to use, and can be drawn quickly and easily on the side of an activity page or a scrap piece of paper. All the student needs to do is draw a straight line! 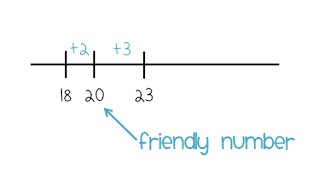 When using an empty number line, I like to talk to the students about “friendly numbers.” A friendly number is simply a number that is easy to work with. This normally refers to multiples of 10. Here’s an example of using an empty number line for the equation 18+5. First, draw a line and label the “18.” Then, it is time to find a friendly number. The number 20 is “friendly,” so we draw a line and label it “20,” and then add the “+2” above the line to show that we have added a total of 2. Now, to add a total of 5, we need to add 3 more. We can now easily add 3 to the 20 to make a total of 23. Make sense? Here’s another example, this time a bit harder. Let’s try the equation 27+19. Again, start by drawing a line and labeling it “27.” Then, figure out how to get to the next friendly number. In this case, “30” is the next friendly number and we can reach it by adding 3. From there, we can jump to the next friendly number, “40” by adding another 10. So far we have added a total of 13, so we need to add another 6, to get to a final answer of 46. Empty number lines can also easily be used with subtraction. With subtraction, you can start with the largest number and count back, using friendly numbers along the way. 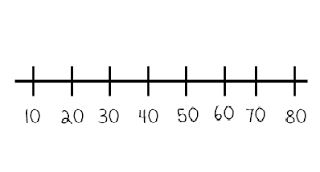 Number lines are just one more tool that students should have in their “math toolkit.” We also want students to know how to use other tools, like ten frames, base 10 blocks and strategies such as counting on or doubles. This way, when they are faced with an equation they can choose the most effective and efficient tool for the job. What a good idea!!! I always thought I was good in math until I tried to teach it…haha! Thanks! You should probably stop calling it 'friendly numbers'. That's a real term used in number theory for a completely different thing. It's very likely you're going to confuse students for a good chunk of their lives. 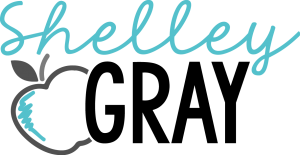 Do you have a parent workbook? I learned math the way it's used in real life. 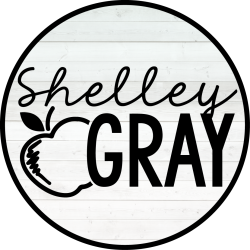 What was wrong with the way we were taught – I use math every day and I really don't see how this way is any faster than the way I was taught. Wow! I can’t believe I never thought of friendly numbers. Love your idea.